AN-UM-SMC-AS-J+MM-SFP-KIT Will Automatically Detect 10 Mbit/s or 100 Mbit/s Fast Ethernet or 1000 Mbit/s Gigabit port - You just need plug in the cables and it will work right away! Powering it up? Easy, it will come with AC power adapter in set, just plug it! 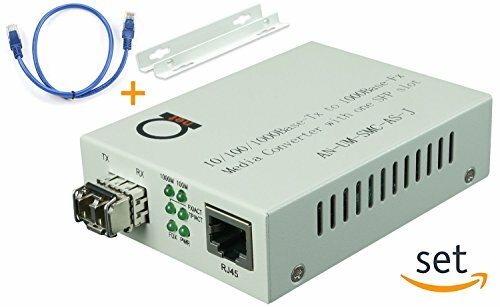 Media converter will extend Your LAN network with any standard Ethernet interface to distances with 550 nm (0.34 miles) or less - you no need to use attenuator also for significantly less distances than 550 nm (0.34 miles) as well. Setup of these units are really easy as the 3 steps shown in picture gallery, and all default settings will work for all of your cases, but for sophisticated users we had created some more customized settings available via dip switches on unit's back panel. It's always good to have versatile and adaptive unit to all Your cases!